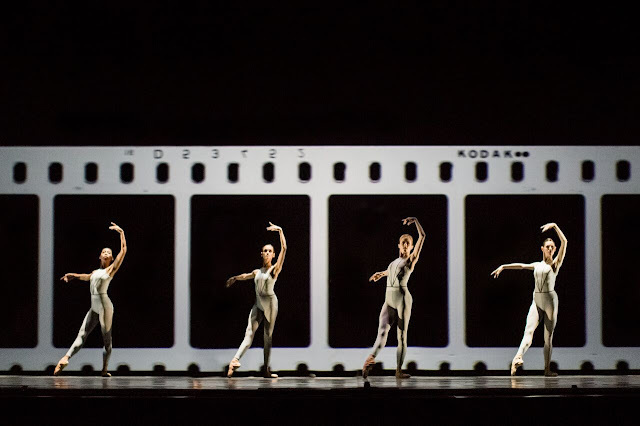 Frame by Frame, a new Canadian ballet about National Film Board animator Norman McLaren, had its world premiere at Toronto’s Four Seasons Centre for the Performing Arts on June 1, and with results as variable as the lines and shapes animating one his low-budget, high-impact films. Masterminded by Canadian theatrical powerhouse Robert Lepage in collaboration with the NFB and National Ballet of Canada dancer and choreographer Guillaume Côté, the 110-minute work (whose final performances are this weekend) features 22 company dancers in addition to film, video and theatricalized special effects. But in addition to all the technological wizardry making this a ballet for the digital age, a small wooden body figure, the kind typically used by art students for figure drawing and appearing both at the beginning and the end of the intermissionless show, absorbs your attention. The bendable mannequin serves several purposes in the work, dramatically and thematically speaking. First, it early on establishes the art-school roots of the Glasgow-born filmmaker who drew image and sound directly onto celluloid to expand the boundaries of creative animation. Second, it underscores McLaren’s deep-set fascination with the expandable kinetics of the human form and with movement in general, the inspiration behind his award-winning moving pictures. Third, being a kind of toy, it helps elucidate the filmmaker’s playful side. Finally, appearing at the end of the ballet as a stand-in for McLaren, who passed in 1987 at the age of 72, the double-jointed model symbolizes the hyper-flexible mind which shaped his long and arrestingly innovative career. It’s a small prop but it speaks volumes about the late Canadian film pioneer, and how well Lepage has read him in creating this, his first full-length ballet. Adam Driver and Golshifteh Farahani in Paterson (2016). We are pleased to welcome a new critic, CJ Sheu, to our group. Many reviewers praise Jim Jarmusch's Paterson (2016) for finding meaning in the quotidian. That’s not exactly true. Some reviewers call it a fantasy, and this gets closer to the heart of things. What makes Paterson such a wonderfully coherent and satisfying film, and what makes every shot meaningful, is its cinematic conceit: we are seeing the world as it is perceived by (but not necessarily from the point of view of) the protagonist, a poet named Paterson (an amazingly understated Adam Driver). 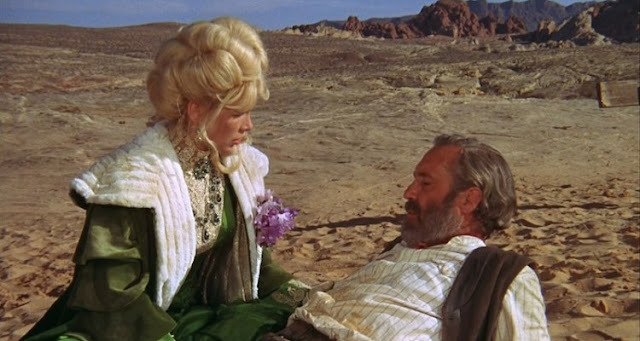 In a brilliant essay for Critics at Large on women in Sam Peckinpah’s movies, Amanda Shubert wrote that The Ballad of Cable Hogue “distills the romantic spirit at the core of Peckinpah’s sensibility: love without possession.” In the romance between Cable (Jason Robards), who finds water in the middle of the Arizona desert and turns it into a watering hole called Cable Springs for stagecoach passengers, and Hildy (Stella Stevens), a prostitute whom the citizens of nearby Dead Dog run out of town, love without ownership is merely an extension of the transitoriness to which they are philosophically dedicated because they recognize it as the state of things. In the movie’s opening episode, Cable is robbed by his partners, Taggart (L.Q. Jones) and Bowen (Strother Martin) – playing a variation on the bounty hunter roles they created in Peckinpah’s The Wild Bunch the previous year – and left for dead without water in the desert. He survives four dry days through sheer orneriness while, like Tevye in Fiddler on the Roof, he keeps up a running monologue to God, assuming that his maker has no intention of letting him die of thirst. He finds water just as he’s about to give up, but the sign of God’s grace at the eleventh hour and the sudden twist in his fortune impart an indelible awareness of morality and the fact that we don’t own time, or our own lives. For Hildy, Dead Dog – a town that deserves its name – where she ekes out a ramshackle existence, seeing customers in a room above the saloon, is merely a way station for her; her destination is San Francisco, and being forced to leave brings it that much closer. She stops by Cable Springs and lives with Hogue for a few blissful weeks – what the characters played by George Clooney and Jennifer Lopez in Steven Soderbergh’s Out of Sight would call a “time out” from their lives. She wants him to come with her to San Francisco, but he’s stubborn about waiting for Taggart and Bowen to swing through the desert again so he can get his long-awaited revenge. So she goes on without him. She returns for him three years later, this time to invite him to New Orleans, after he’s had that revenge, or something like it; by now he’s ready to run away with her. But fate has other plans, and Hildy is its unwitting envoy: the chauffeur-driven automobile that brings her slides down a hill, Cable steps in, instinctively, to save Bowen, and he ends up getting run over. Hildy keeps him company during his last days, and leaves after his funeral. To celebrate her 15-year dancing career, Saniya Abilmajinova gave herself the gift of a ballet gala which she presented – at her own expense – at the Toronto Centre for the Arts for two performances only, May 19 and 20. The Uzbekistan-born dancer, recently made a Canadian citizen, called her two-hour program Follow Your Dreams, an inspirational title suggesting an unwavering commitment to a personal goal. Rising repeatedly up on her pointes to perform the lion’s share of the work, both classical and contemporary, Abilmajinova never once lost hold of the electrifying elegance which makes her, a tiny dancer with an outsized talent, such a delight to watch. 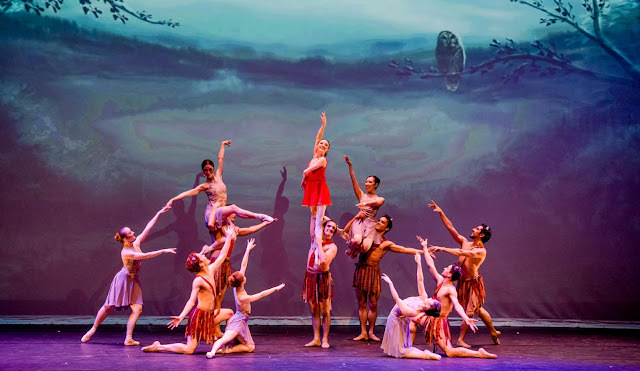 A graduate of the Choreography College in Moscow, Abilmajinova started her professional career in Russia as a first soloist with the Natalya Sats Musical Theatre, a Moscow-based company specializing in ballet, theatre, and opera productions for children. She quickly distinguished herself, becoming a two-time medalist at the International Ballet Competition in Berlin (the silver in 2005 and the gold in 2007) and a semi-finalist at the International Ballet Competition in Moscow in 2009. That same year, she immigrated to Toronto to join Ballet Jörgen, a touring company routinely taking ballet across the country, often into far-flung communities where professional dance rarely ventures. In Canada, she found her dream job. Joachim Waibel self-portraited as a moment in his "Stalingrad" series. I have observed and written about the mixed-media art works of Joachim Waibel for some years now. His style has been, up until now, recognizable as postmodern pop art with a charming conceptual twist and an abundant satirical humour. However, with his latest body of work, the “Stalingrad” series, his work has gone from compelling to utterly mesmerizing, and he has launched it into a darkly stratospheric level of aesthetic quality which is both thought-provoking and deeply emotional. What does it mean for an artist to be a hero in his own time, or at least the hero of his own life? To an observing art critic and curator, and a lover of powerful images writing in the 21st century such as myself, it means persevering as a painter in the flickering shadows of the digital realm and stubbornly refusing to stop painting, to pick up a camera, video, film or computer equipment. To continue making archaic marks on a textile surface which harks as far back as the medieval period and reaches restlessly forward far into the haptic future. 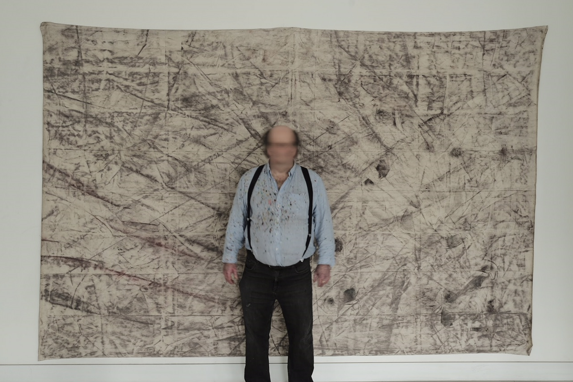 That stubbornness, a creative commitment to pigment and canvas, even when it’s exercised with an almost esoteric and alchemical charm as Waibel’s work does, is what makes an artist of today’s time a heroic figure. 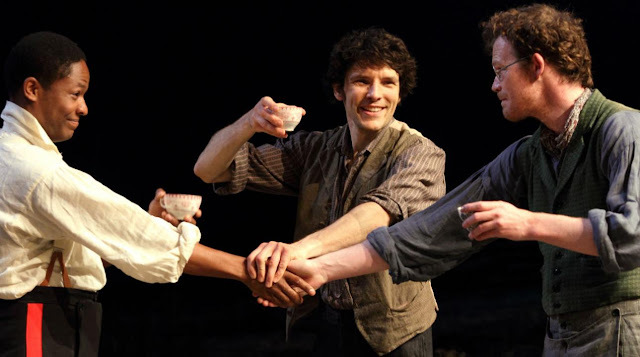 Brian Friel’s 1980 Translations, one of the great works in the modern repertory, dramatizes the earliest phrase of the Irish “troubles,” nearly a century before the term was coined for the Easter 1916 rebellion. Friel’s play is set in the rural town of Baile Beag in County Donegal in 1833, where the British Army has sent an expedition to draft a new map of the territory that Anglicizes – and implicitly alters irrevocably – the old Irish place names, which memorialize locals long dead, incidents long ago fictionalized, a mythology as well as a history. I last saw the play in a first-rate production by Garry Hynes on Broadway in 2007; the new revival at the National Theatre, directed by Ian Rickson, is just as good, and thanks to the work of the set designer Rae Smith and the lighting designer Neil Austin (as well as Rickson’s expressive staging), it’s even more beautiful to behold. The hedge-school that Hugh (Ciarán Hinds), the aging, alcoholic classics master, conducts in his home with the assistance of his son Manus (Seamus O’Hara) is a downstage playing area in suggested-realist style that morphs into expressionism as the set takes us into the surrounding countryside beyond. As the characters enter, Austin’s lighting silhouettes them against flashes of red, which is especially striking when the British officers, Captain Lancey (Rufus Wright) and young Lieutenant Yolland (Adetomiwa Edun), who is in charge of the actual mapmaking, appear to introduce themselves. When the scene shifts to evening at the top of the second act, specials hover above the stage, creating strange, cylindrical metaphors for starlight, and the field upstage of the hedge-school is dotted with lanterns. Gorgeous.